The ‘Pocket Rocket’ Rosie Horne back for her 11th Festival performance! We are very happy that a great friend and supporter of the festival, Rosie Horne will be back to perform at this year. 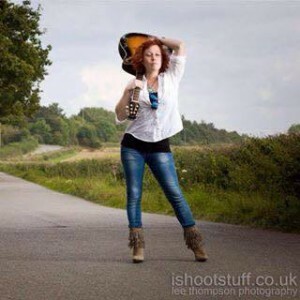 Rosie is very well known locally for her power-house vocals, and energetic performances where her nickname ‘Pocket Rocket’ has derived, and we are totally thrilled she is with us again, her 11th year at Festival in The Park! Not only is she performing as a solo artist, her band Bloodstone Blue are headlining on the Saturday evening. I managed to catch up with Rosie and asked her to spill the beans on her music and being involved with the festival. So Rosie, you have played Festival in The Park previously? What do you like about performing at the festival? I have been honoured to have performed at Ashford Festival in the Park since the very start. This will be my 11th year with the Festival. The Team running Ashford Festival I hold very close to my heart and have become dear friends of mine too. As a young Musician at the time it all started the support I received from the team, everyone involved and the crowd was truly amazing and the same support is still given to me, the band and all local musicians now, either well known or up and coming. Ashford folk love to party and have always been a supportive crowd. I look forward to this weekend every year! So tell us a bit more about you, your musical influences and where we can catch up with you and your music? Me, well, where do I start? I have been on the stage ever since I can remember and for me it is a way of life. I spent between the ages of 17 – 21 travelling across Europe and USA performing wherever I could and have built my world around music really. Although I perform as a Solo Artist, I am also the Lead Singer of Bloodstone Blue, which is a Rock and Blues band which keeps me very busy. I am a massive fan of Rock, Country and Blues, but my influences expand far beyond that as I have never been a genre specific person. If a song, piece of music or artist stops me in my tracks, then I am hooked. If you head to my website: www.rosiehorne.com you will find my Gig List for this year. There are links to my Facebook, Youtube and Bloodstone Blue website too. Children naturally love art – painting, drawing, making music and the theatre. I know first-hand the benefits of being exposed to music and the arts at an early age. It helped me to escape and learn the harsh reality of growing up, experiencing those first raw emotions, but also taught me the importance of it too. It opened my horizons and helped me to dream. It has pulled me out of my comfort zone! Without the exciting and disciplined lifestyle I have led, I know I wouldn’t be as strong as I am now, but also, I wouldn’t be as creative and passionate as I am now. I first took to the stage at three years of age as a dancer. My Journey through the arts has helped me in some of the toughest, loneliest and fulfilling periods of my life so far and there is so much I have to thank music and my career for. My life would be empty without it. This is the Festival’s 11th year! As a local musician do you feel it is important to have this kind of event available to our local community? It is really important! It is a family orientated event which allows everyone to have a great time! It is Free Entry to all and the amount of support it gives, not only to all Artists but to the public too, is awesome. Seeing Ashford Festival in the Park grow, expand and become the weekend of the year for many has been wonderful to watch and also be a part of. I love to perform. Music isn’t just a hobby for me; it is how I make my living. For me, being able to work in an industry that I love and can express myself in, is a blessing. As soon as I hit the stage, I will be ready to give it my best and have a blast too! See you all there!